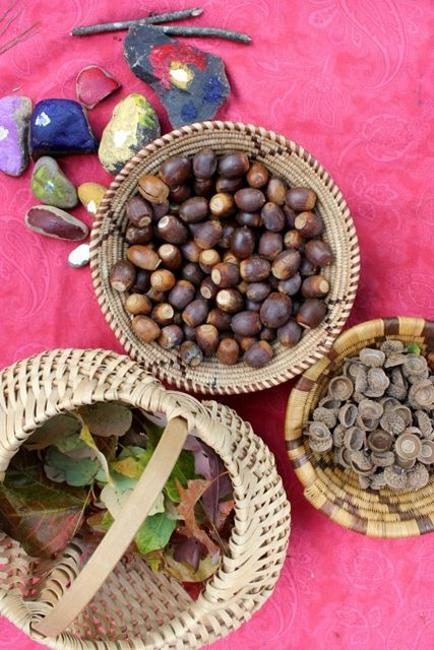 Acorns are great, eco friendly, free and beautiful material for making fall crafts and home decorations in autumn. 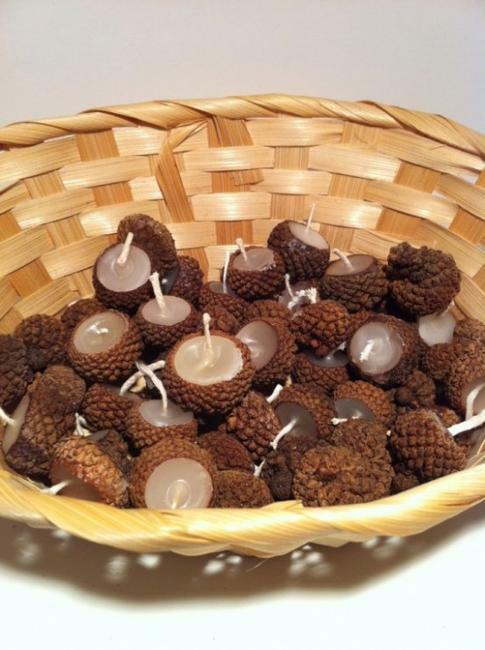 Acorns bring unique texture, fabulous shapes and comfortable brown colors into rooms and beautify table centerpieces with natural, elegant and attractive look. 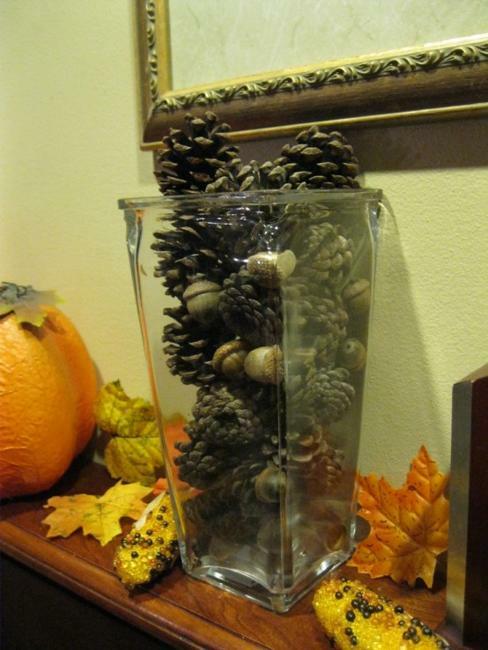 Adding acorns to fall flowers, leaves, pine cones or apples create fantastic table decorations and centerpieces. 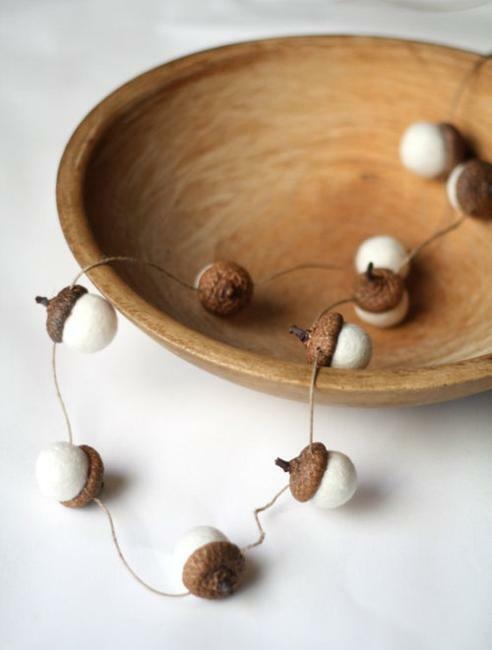 Acorns are the versatile material. 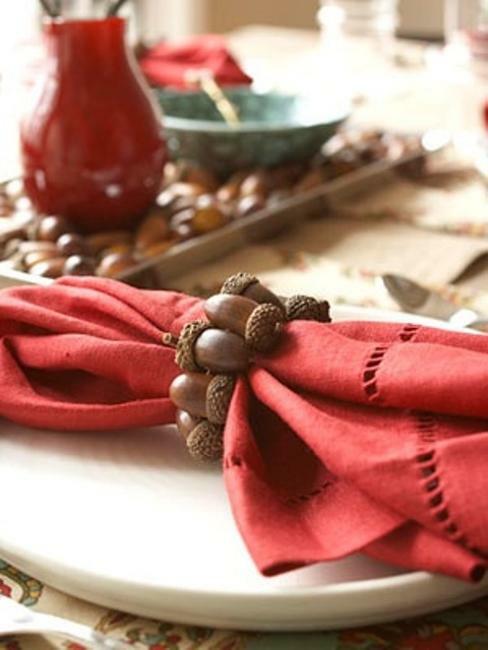 Table decorations and centerpieces with acorn symbolize fall decorating ideas and suitable for any occasions and holidays. 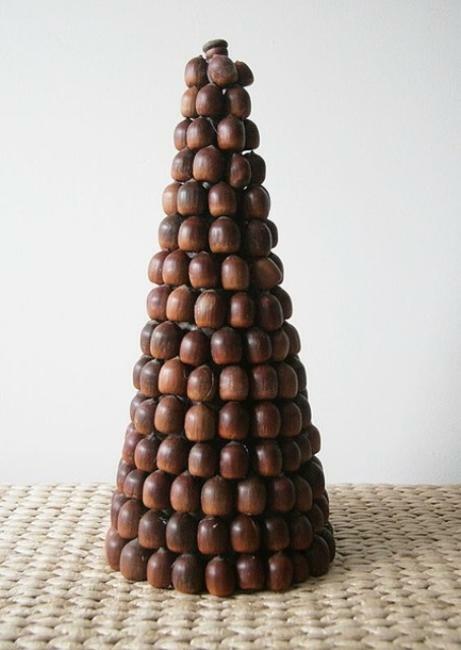 Making home decorations and table centerpiece with acorns are fun. 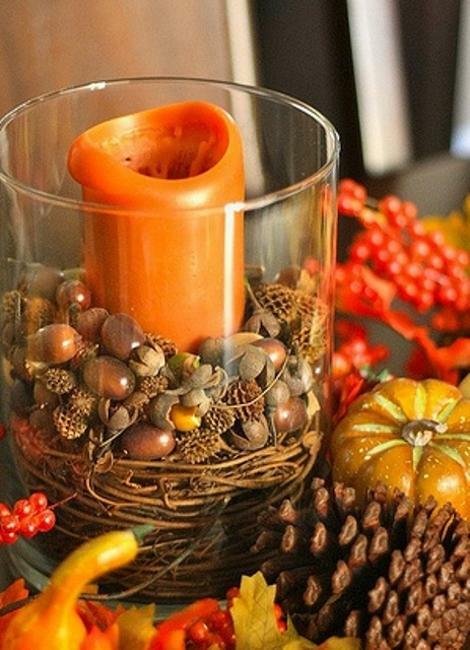 Glass candle holders, plates and vases look fabulous decorated with acorns, fall flowers, pine cones or fall fruits and vegetables. 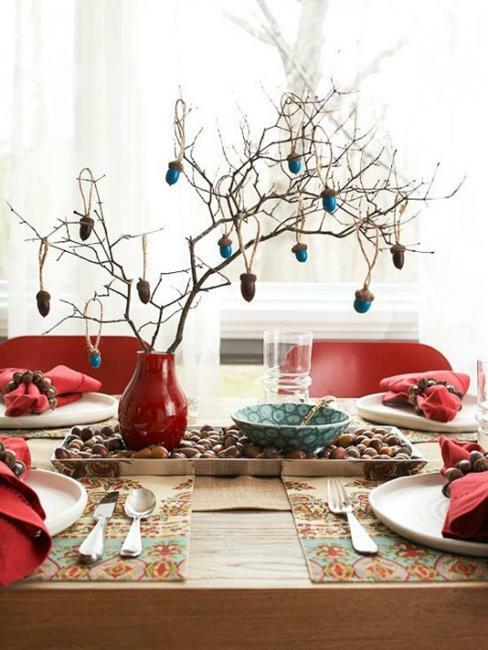 Acorns add comfort and cosiness with brown colors and turn dessert dishes, candle holders, vases or footed dessert cups into stunning table decorations and centerpieces. 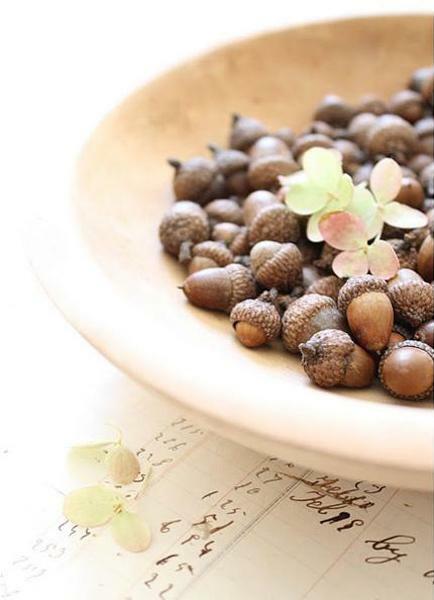 You can fill glass vases with acorns or secure them with glue on your fall wreath, adding natural feel and organic look to your handmade fall decorations. 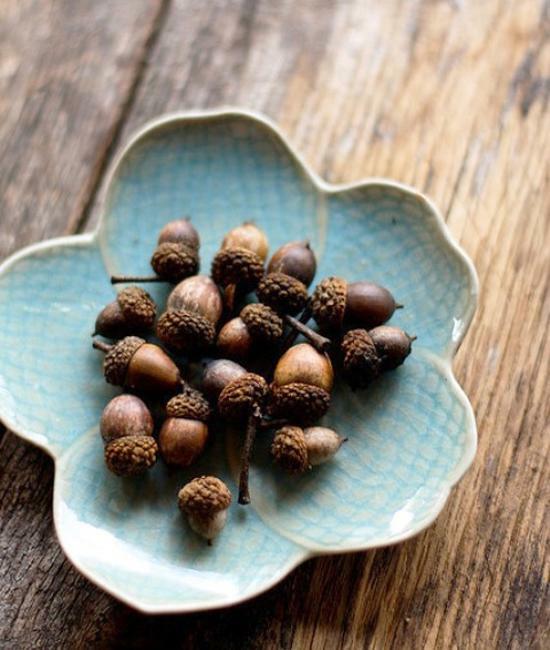 Combined acorns with fall leaves and small pine cones on a dessert dish, creating gorgeous, eco friendly and inexpensive table decorations and centerpieces. Clear glass bottles and glass jars make great candle holders. 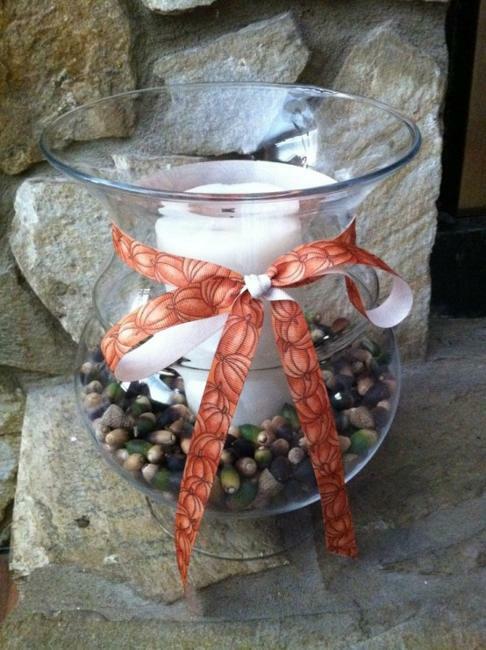 Decorated with acorns and candles in fall colors, these candle centerpieces look amazing. 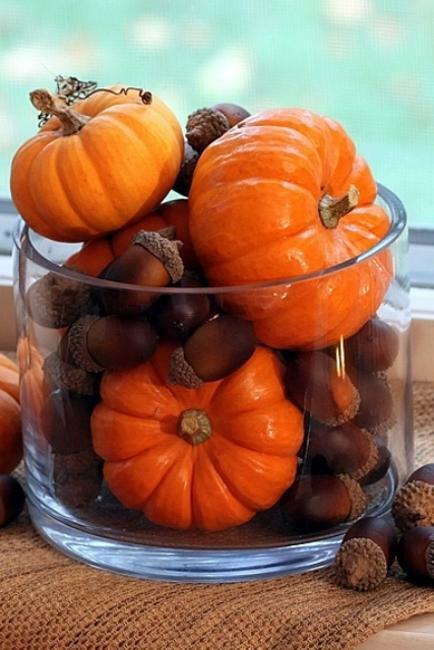 Pumpkins and gourds add even more charm to acorn table decorations and centerpieces. 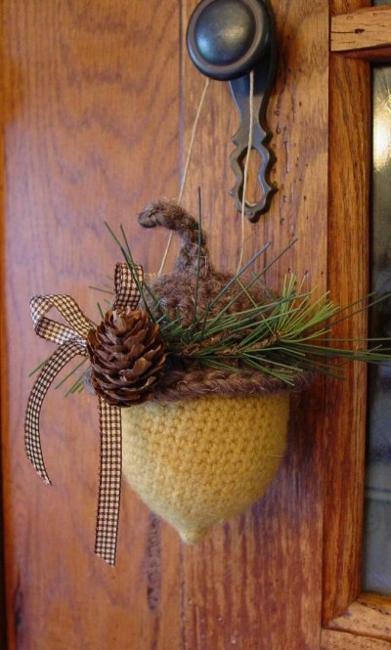 Straw and twig wreaths are inexpensive and easy to decorate with acorns. Use this fantastic eco friendly material in a combination with fall flowers, burlap and corn husks for impressive handmade home decorations. 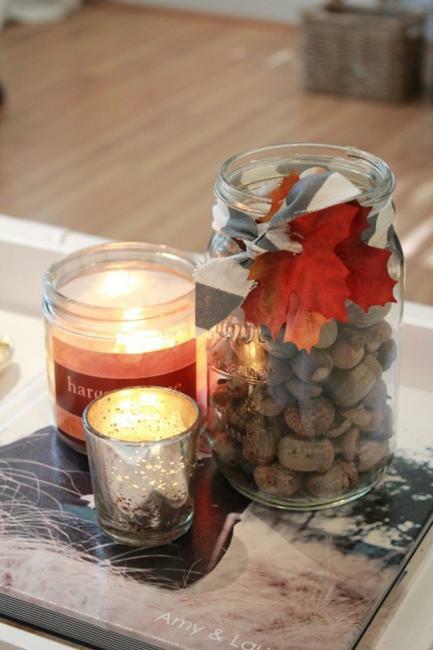 Fall crafts made of natural and recycled materials are a great way to support Green living ideas. 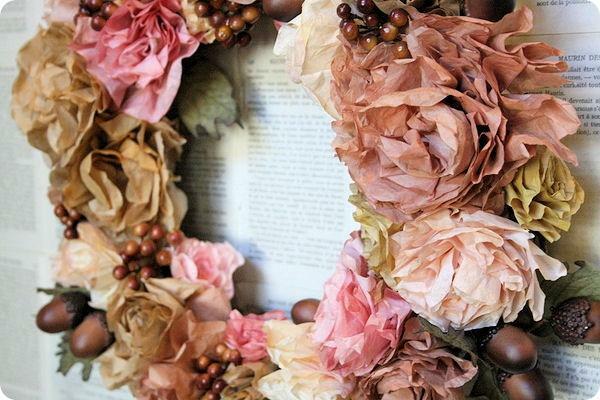 Fall crafts are a wonderful way to experiment with natural, free and eco friendly materials. 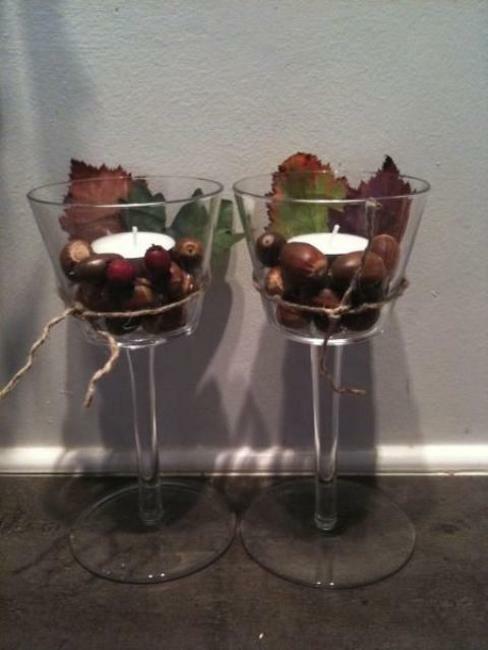 Fall is the great time to start making decorations, table centerpieces and crafts with recyclables. 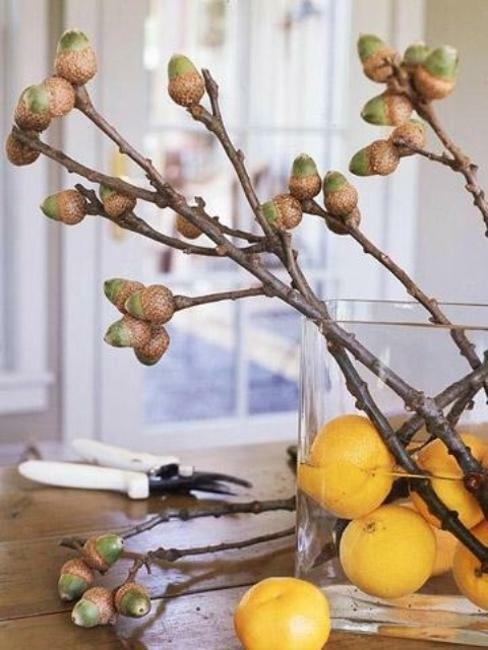 Acorns work well with many materials, so your can add recycled paper, metal, wood, twines, twigs and fall leaves to your fall decorating with acorns. 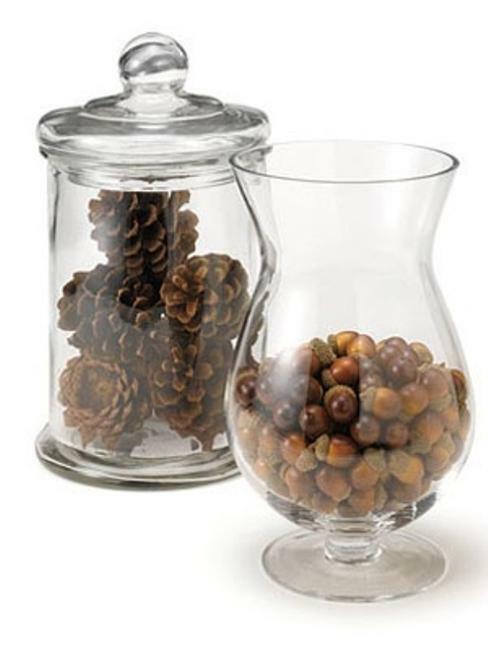 You can add candles or small LED lights to your table decorations and centerpieces, turning simple glass jars with acorns into unusual. interesting and elegant table decor. Metal cans with drilled holes and LED lights can work as beautiful additions to your acorn table centerpiece ideas, creating simple and pretty lanterns that enhance fall decorating with acorns. 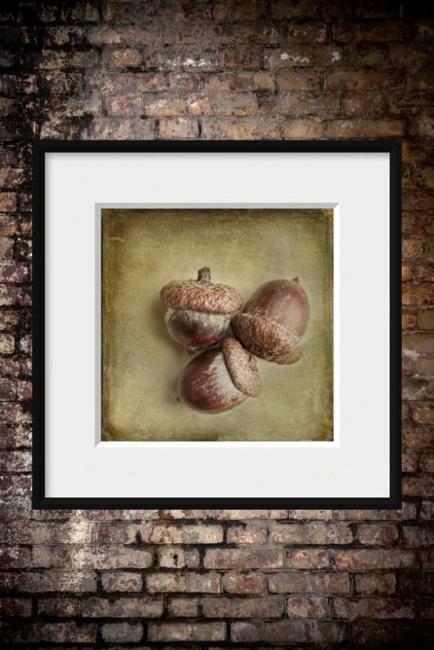 Acorn table decorations and centerpiece ideas add fun and joy to your fall decorating and make your fall holiday decor look meaningful and original. 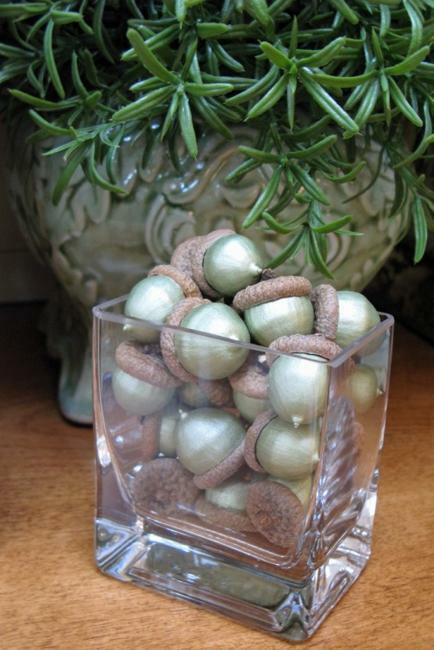 Acorns add brown colors and make table decorations feel comfortable and relaxing. Their gorgeous texture and unique shape add charming details to table centerpiece ideas. 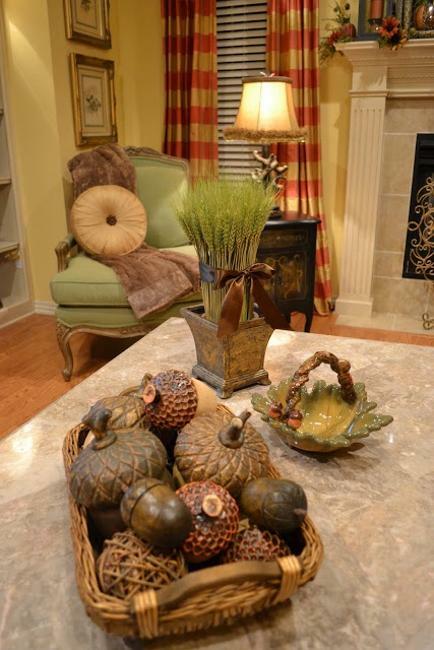 Acorns are perfect for home decorating for the fall season. 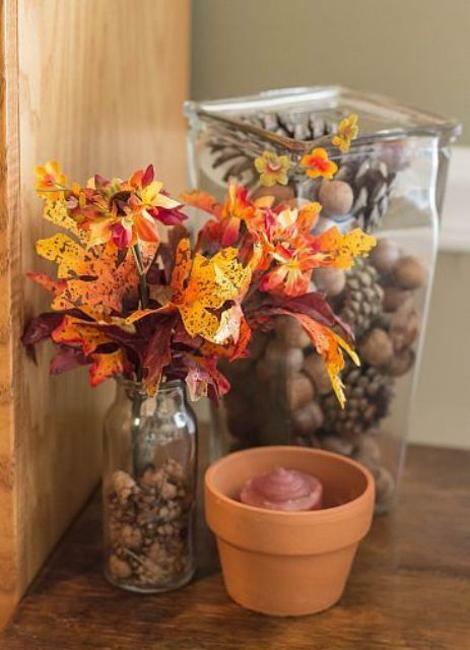 Starting in September, they can be combined with different materials and holiday decorations, changing table decor with a few decorative details as the season progresses and offering numerous opportunities to create beautiful, unique and elegant fall table decorations and centerpieces, celebrating this gorgeous season.